If a centenary celebration isn’t enough, Sutton Tools has also taken out the year’s top awards from Business Victoria. Throughout its rich history, Sutton Tools has collected an impressive list of awards and achievements. 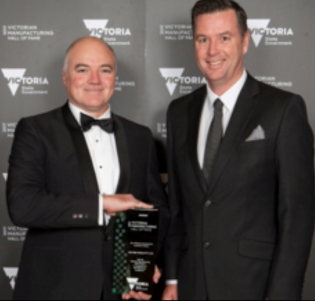 Its induction to the prestigious 2017 Victorian Manufacturing Hall of Fame and the 2017 “Manufacturer of The Year: Large Business” award is the latest recognition for this large family owned Victorian employer. Sponsored by the Department of Economic Development, Jobs, Transport and Resources, the awards were presented recently at the Manufacturing Hall of Fame 2017 Gala Dinner and Awards Ceremony staged by Business Victoria. The 2017 theme of ‘Growing Advanced Manufacturing’ recognised outstanding achievements by Victorian businesses and individuals who uphold a high standard of excellence in Victorian manufacturing. Judging parameters included advancements in technology, manufacturing techniques, rate of growth and application of Lean manufacturing and adoption of best practice throughout the business. The selection panel comprised senior decision-makers from industry associations. The company attributes much of its global success through the strength of engineering department which has state-of-the-art technology in measuring and design equipment which has been critical to the company’s continual development of machine tools. It operates an international distribution centre that deploys modern radiofrequency scanning technology and automated stock replacement systems. These permit accurate stock control of more than 20,000 SKUs. Drawing on the resources of global industrial cutting solutions organisations has been recognised as an important part of the company’s success. Partnerships with manufacturers such as Tapmatic, Ceratizit and Allied Machine and Engineering have enabled Sutton Tools to leverage the strengths of their respective product lines to offer a broad range of high performance solutions to the Australian industry. Photo: Sutton Tools’ managing director Peter Sutton (left) with Wade Noonan MP.